The family was seated around the table, eating lunch. Stella, their owner, often had to stay away from home for weeks at a time on business. 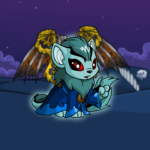 Usually her pets (Lurina_3 the Striped Xweetok, Lallinara the Blue Xweetok, Shedars the Ghost Xweetok, and Loranisa the Christmas Uni) would stay at the neolodge, but after a certain ‘incident’ last time, they had refused to go. Shedars had been adopted as a green Xweetok, and was originally a very happy and cheerful neopet. She had requested to be painted ghost. Stella had bought her the required paintbrush without objection. But as soon as she was painted, everyone began to notice changes in her. The happy Xweetok had gone from happy to normal to downright reclusive. She had given away her colorful wardrobe and bought black clothes and shoes. She had stopped speaking to anyone, and had started to go through walls and creep out anyone unfortunate enough to be in the room. Recently, however, she had stopped being so different and had started to speak to her siblings and mother. The Ghost Xweetok had even begun to smile a little now and then. In fact, she was a pretty cool sibling to have. Her old friends had come back and her wardrobe even had few colors in it. But this also had a downside. Even when she was Green, she had liked the idea of being able to use magic. A few days after her new personality had appeared; she had walked up to Stella and asked for permission to be a faerie’s apprentice. Her mother knew that this was a long time dream of Shedars’s, so that very day she had informed her siblings. The next week Shedars had packed her bags and gone to Jhudora. Completely off topic, I think you should know that Jhudora really isn’t so bad. Sure, she has those awful temper tantrums, but really, really, really, really, REALLY deep inside, she isn’t so bad. Anyway, back to Shedars. Jhudora asked Shedars a few questions and had appointed her as an apprentice. After a couple of weeks, Shedars was taught a few spells. It turned out she was good at it and that impressed Jhudora, who continued to teach Shedars. Now, three months later, the family had started to miss Shedars horribly. They had asked Jhudora to let Shedars come home for a couple of weeks. Jhudora had been in a good mood and did not burn the letter immediately. Instead she wrote back to say to expect Shedars in a few weeks time, THEN she burnt the letter. “But-” Lalli was cut short by a tap at the window. It was a Mail Weewoo. The petpet had the latest issue of the Neopian Times with it and also a small purple envelope. Stella opened the window to let the petpet in. After handing her the items, it flew away. Stella eagerly opened the letter and read it out lead. I am writing to you that I may be home today. Please expect me by five pm NST at the latest. I love being Jhudora’s apprentice. She taught me all these cool spells that I can’t wait to try out. You must probably be surprised to see me writing in green ink, as I hate the color, even though I was painted green for a few years. This is because this is Jhudora’s favorite color of ink. Oh, I’m rambling on, aren’t I? I’ll tell you everything once I get home. Besides, I also have a surprise for you all. The family was waiting somewhat impatiently in the living room for Shedars. Loranisa peeked from behind the couch. Lallinara crawled out from under it, and Lurina jumped down from the ceiling. Stella came back into the room. “More than you can imagine!” Loranisa replied. After Shedars told them all about her stay with Jhudora, and her siblings had brought her up to date, they questioned her about her surprise. Shedars grinned mysteriously before answering. “You bet!” the pets all answered at once. “This is going to be so much fun!” Loranisa exclaimed. Shedars smiled (a bit spooky on a ghost pet), and went up to the wheel. She performed a complex set of hand and finger movements, and the yacht slowly started to move forward. Lallinara watched with interest. “That is so cool, Dari!” Shamikatzu said. Shami lived on Mystery Island (on one of Stella’s side accounts) and had decided to come with them on their trip. They were soon in the open sea. Loranisa sat in a deck chair and sighed. “Nothing can ruin this vacation!” Saying so, she put on sunscreen and dozed off. Of course, if you say things like that, chances are you’ll be jinxed. Later on, Loranisa said that this is what had happened. The thing is she had forgotten that fate often throws these unforeseen ‘disturbances’ your way. In this case, it was a storm. As Shedars fought to regain control of the ship, her siblings helped her as best they could. Unfortunately, this wasn’t enough, and they were thrown overboard. Shedars put a hasty air bubble over them, but it wasn’t perfect as air bubbles are air and water faerie magic. Nevertheless, it was enough to keep them alive until the storm was over. When they surfaced, the yacht was nowhere in sight. Lurina couldn’t help but wonder if the faeries had insurance for it. There was no time to worry about that now, though. They had to find a way out of this predicament. “And me with hardly any magic left!” Shedars said. “Can’t you recharge it, somehow?” Lallinara asked worriedly. “Then let’s get there fast!” Shedars said and raised her paws. The water around them glowed a shade of purple for a second and then they were zooming forward underwater. Soon they were beside the ship. Lurina’s eyes grew wide. An orange Wocky appeared. He looked surprised and then went away. “Where’s he gone?” Lallinara asked miserably. Then a yellow Usul and a red Kyrii looked down at them. A rope fell down and the girls climbed up. As soon as they were all on deck, the yellow Usul who was the captain spoke to them. “You’re girls, aren’t you?” he said, making it sound as if females were something to be avoided. “That’s kind of obvious,” Shedars replied.